I have a very useful folding knife that I carry almost all the time with me. It is a cheap C. Jul Herbertz folder, made of AISI 420 stainless steel. I decided to try making a custom leather sheath for it. 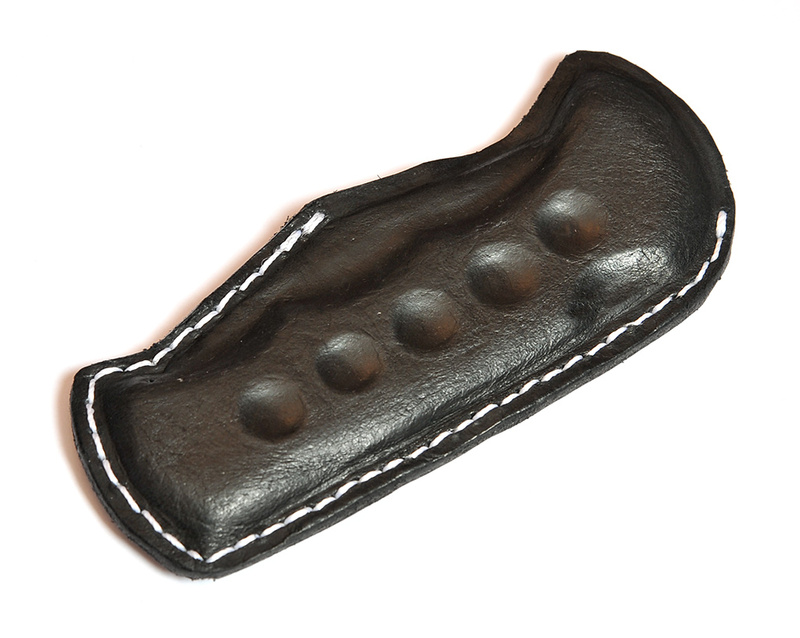 I’ll use some scraps of soft black leather I have around. First, I wettened the leather in plain water for 20 minutes. In the meantime, I drew the contour of the knife (folded) on very thick (~6mm) leather scraps to make two frames I’ll use to stretch the thin leather over the knife. 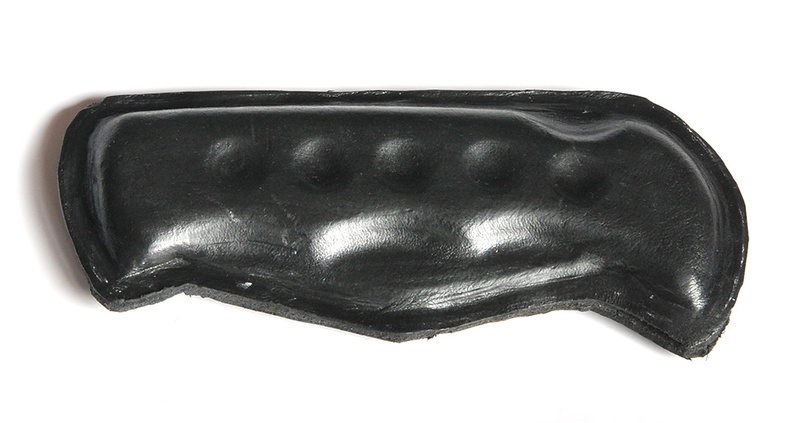 The interior of the leather frames are a little larger than the knife itself, to accommodate the knife ant the thickness of the leather sheath. 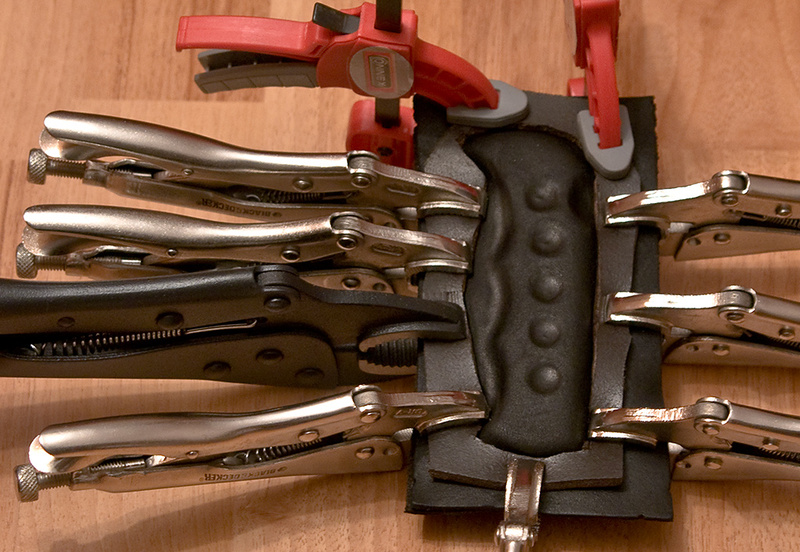 Then, I applied some glue on contacting parts, stretched and clamped the wettened leather around the knife using the thick leather frames and some locking pliers. After firmly clamped the wet leather around the knife, I have repeatedly accentuate the contour of the knife using a small spoon with round edges. I have done this for around 15 minutes. When finished, I let the leather dry overnight. In the next morning I removed the pliers and frames and cut the sheath around the folder letting a 5mm border for sewing. Because the leather become a little to harsh and hard, I spread a little black shoe polish paste over it. This is a good looking knife that is not too big or too little. It is quite possible to open this knife one handed using the thumb stud, it just isn’t all that fast a process (about as fast as opening a standard pocket knife with two hands). I made the leather sheath so I can carry it in my pocket or in my backpack along with other items that may be damaged by a hard object (e.g. : a photographic lens). But I made it also for fun ! Thanks for commenting on my blog !